If you value your feet at all, do not, repeat do not, order your size. I think my feet died a little when I first squeezed these on. They came up so impossibly tight that I had to check whether or not I had made a mistake and ordered a 4. No, they were a 5, they were just so BLOODY SMALL. As time has passed they have loosened up a tad and I predict in about a month's time they will be an ideal fit. This all sounds a bit too much work for a pair of high street shoes but….do you know how rare it is to find a good leopard pointy toed shoe that doesn't cost the earth? As someone who categorises herself as a stalker of said shoe type I can tell you, it's really friggin' rare. The print is nice, the quality good…it's just that the fit is a little off. This is definitely a shoe to buy in store where you have an opportunity to see if you fit the slipper, Cinderella style. I like to wear them with a slightly cropped jean. This pair are also from Topshop (#notsponsored) and are what I would deem a plebby fit. Medium wash, medium rise and straight leg - they make a nice break from impossibly skinnies and unflattering boyfriends. I will also say that the denim is a very sturdy, reliable quality. I am kind of sick of having a saggy arse after wearing lycra-laden jeans for a few hours and pleasingly, these have a good strength and stiffness to them that avoids that from happening. Loafers: Topshop - Link! but do go in store for these and don't order online is my advice. I am VERY excited as I write this post as I am just about to start packing for my mini break. I need to pull all my exciting white, black and grey clothes and figure out what last minute washing needs to be done. The husband has suggested that we share a suitcase - LOL! What a joker! I've found that with Topshop shoes before, particularly loafer styles. These are gorgeous, and I love the jeans. These are so great. I have a similar pair of leopard loafers that I basically live in all season long! These are so great! I love a bit of leopard print with an otherwise plain outfit. I'm so used to shoe sizes being much smaller than advertised so I would never dream of sizing up if I were to buy these. The way your pair the shoes is lovely. Lolling at the sharing a suitcase. AS IF! I can't even share when going away for a 2 night trip. Loving the leopard Laura! Your hair looks amazing too. Have fun on your break & make sure to Snapchat. My hubby once suggested the very same thing & I laughed in his face!!!! Haha, your husband really is a joker! My husband suggested that once too, but after seeing that there was only space for one pair of socks left for him, he quickly pulled out the second suitcase. I'm always scared to wear leopard print, I always thought it was out of my comfort zone! You've shown me ways to make it TOTALLY wearable! 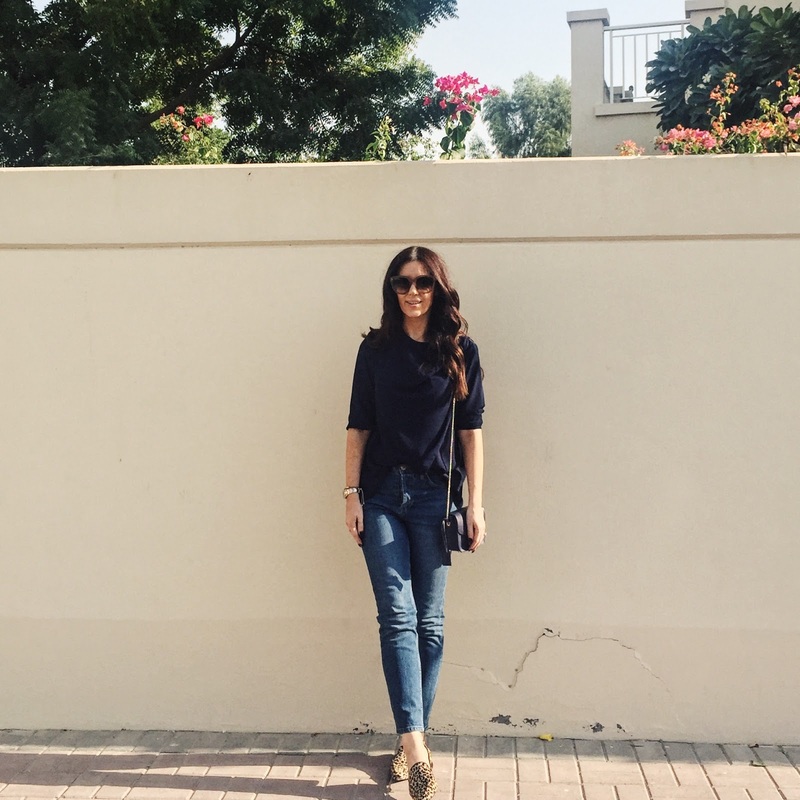 love this post - i used to live in Dubai too! just stumbled across your blog and i'm in love with it! really loving the design and esp those leopard flats!